Sup, everyone? Today we will be discussing hyaluronic acid’s benefits for skin, and why molecular weight is important! As always, I will be going over the science and studies behind it in an easy-to-understand manner (or at least try). Product recommendations are at the bottom of this post. Alrighty, let’s get you up to speed on everything you need to know! 3 Hyaluronic Acid Molecular Weight. Why it’s IMPORTANT! 4 Diameter of Hyaluronic Acid. Hyaluronic acid (HA) is a naturally occurring glycosaminoglycans found throughout the body’s connective tissue. (1) Glycosaminoglycans are simply long unbranched carbohydrates, or sugars, called polysaccharides. For starters, it can bind up to 1000 times its weight in water! That’s one of the main reasons it’s used in skincare — in other words, it functions as a humectant, and holds water molecules onto the surface of your skin to keep it nice and hydrated. Anytime we are talking about skin that is well moisturized, we’re mainly referring to skin that has a lot of water content. Perhaps you’ve heard of the term transepidermal water loss, or TEWL for short? This is the scientific term for the measurement of how much water is evaporated from skin. When a product prevents TEWL, that means it is keeping your skin hydrated by making sure that water doesn’t escape from its surface. Hyaluronic acid does exactly that, i.e. slows the rate at which water evaporating. 11 patients with burn injuries applied 1.5% HA every day, and the study found it actually slowed down wound healing compared to just pure glycerin. (7) Yikes! This may have been because of the concentration and molecular weight of hyaluronic acid. More about this in the next section! A hyaluronic sheet (sheet masks anyone? :p) applied once daily significantly reduced the healing time (p = 0.0003) of ulcers caused by venous insufficiency or vasculitis in 10 patients. (5) In other words, it helped heal ulcers that had inflamed or compromised blood vessels. Hyaluronic Acid Molecular Weight. Why it’s IMPORTANT! What hyaluronic acid is beneficial for skin has to do with its molecular weight and concentration. The molecular weight refers to its mass, or how big the HA molecule is. This is measured in something called unified atomic mass units, or dalton for short. The hyaluronic you want to use should be between 80,000 to 1,000,000 daltons (80 – 1,000 kDa). This seems to be the sweet spot according to studies. Anything higher won’t do much good. Anything lower might cause inflammation. Why do I say this? Let’s break down the studies and you’ll see a pattern. An in vitro study on human skin implants found that TEWL was reduced by 15.6% with HMW HA, but increased by 55.5% with LMW HA! (22) In other words, LMW HA dried the skin out. I wish I knew what molecular weight they used, but I don’t have access to that info. My guess is it’s in the < 50,000 dalton range. 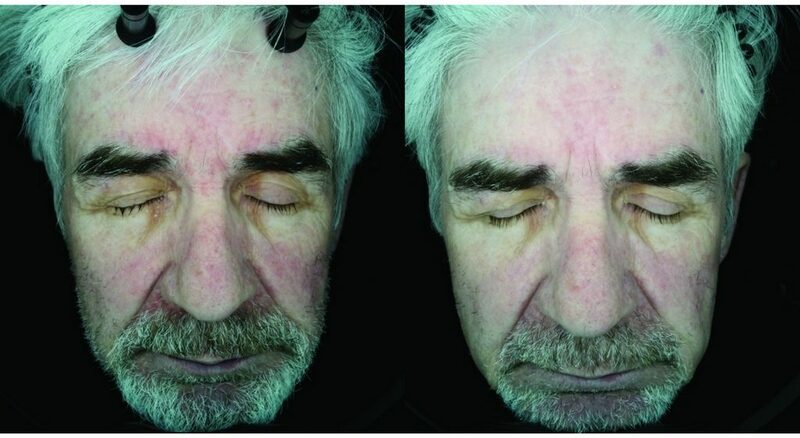 15 patients with facial Seborrheic Dermatitis were asked to apply LMW HA 0.2% gel twice daily. Reductions in scales, erythema, and pruritus were 66.67%, 50%, and 60%, respectively after a month. At week 8 all subjects had made improvements. Here’s a before and after of one of the participants. So on and so forth. The takeaway being that HA between 50 – 1,000 kDa is beneficial for the skin, with ~130 kDa being the best according to human studies. UPDATE 5/29/15: found another in vivo study that showed hyaluronic is beneficial for wrinkles and moisturization between 50 kDA and 1,500 kDa, with 50 kDA having more pronounced effects on wrinkles. This might be a reason super low molecular weight HA is potentially problematic (although this hasn’t been proven with convincing evidence). In other words, it causes everything else to penetrate more deeply into the skin, so if you have a compromised epidermal barrier this might be bad news. Here’s some more interesting data from that same study. This graph is a breakdown of the various percentages and molecular weights of HA on skin hydration after 6 hours. As we can see, 10% 5 kDa HA is pretty crazy! It maintains water content a lot more than the other varieties. 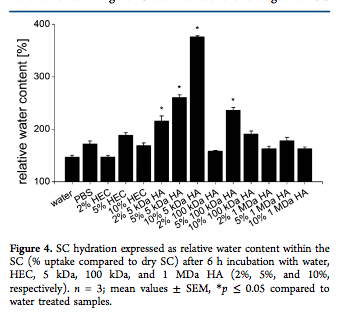 Interestingly enough, the graph also shows that 2% 1000 kDA HA is better than 2% 100 kDa HA in retaining water, which goes against one of the studies done on humans (in vivo). I interpret this as meaning that higher a concentration of hyaluronic acid isn’t always better. According to this study alone, it appears that hydration tends to teeter off after 2% in volume. For this reason, if you’re formulating your own products, I recommend keeping the HA concentration below 2%. If I have lost you, or you are confused about what the hell all this molecular weight and diameter nonsense means — don’t worry! :p Cosmetic chemists are very intelligent and innovative people. There are skincare products out there that take all the guess work out for you by combining various HA molecules for maximum efficacy. It’s like a jam-packed party of hyaluronic acidy goodness. One such example is the Hada Labo Hyaluronic Acid Lotion. Full review here. It comes with 3 different types of HA including Hydrolyzed Hyaluronic Acid, Sodium Acetylated Hyaluronate, and Sodium Hyaluronate. I have gone through two bottles of this stuff. It works great, and is something I personally use after dermarolling to speed up the healing process. UPDATE 5/29/17: a few of you have brought to my attention the Hada Labo Premium Lotion! This is definitely something I will be trying in the future. It has FIVE different types of hyaluronic acid and comes with the addition of one of my all time favorite ingredients — 3% urea! This is a gentle keratolytic (i.e. exfoliating) agent that doubles down as an effective moisturizer. Alright, that does it on hyaluronic acid! Hope you’ve learned something new and found this information beneficial. Hi, I’ve just discovered your blog and have been reading through the endless amounts of amazing information and feel like I’ve learnt so much already, so thank you!! I am a little confused though as I want to add this product to my current routine but unsure of where to put it in my steps. Now my instinct would be to place the lotion before the niacinamide as its pH is 5, but from what I’ve read is it actually correct to put it after the Vitamin C? Thanks again for your amazing informing blog! How can you know when you look at your products, which size molecules are used? 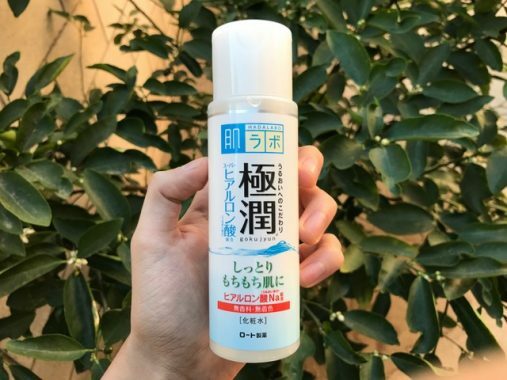 This post is making me all the more eager to try out the Hada Labo Premium Lotion, since it contains 5 types of hyaluronic acid (and 3% urea to boot). I ordered it from Japan so it’s taking its sweet time to show up. As an aside, for the past week I’ve been using a 14% gluconolactone gel-cream and for the first time in more than a year my skin is actually starting to feel normal instead of tight, sensitive, and dehydrated. Not even the regular Hada Labo Hyaluronic Acid Lotion had this much of an effect. This is my first experience with a PHA (much less a high-strength one, with 14% being one of the highest I’ve seen), and I think I’ve possibly found the powerhouse ingredient to replace my azelaic acid & adapalene combo that I’ve been doing for a long time. What ultimately led me to PHA was basically this line of reasoning: because of my seb derm, I’ve been orientating towards more lightweight moisturisers (like liquids and gels) since they’re far less likely to contain ingredients that might aggravate the condition. However, I noticed that using lightweight moisturisers wasn’t doing enough to counteract the dryness and irritation caused by my Skinoren & Differin use. So, looking into ingredients that might effectively treat acne but, crucially, WITHOUT any side-effects led me to PHA specifically, because not only does it not irritate or dry out the skin, it actually strengthens the skin barrier against irritation and provides a lot of moisture. It’s basically a win-win situation. With that in mind, if you’re looking for ideas for future blog posts, maybe one exclusively discussing acne treatments that have zero or minimal side effects, like PHA, could be an option! Great post! How, though, can we be sure that the HA included in Hada Labo’s HA lotion does not include the super and ultra LMW varieties of HA that can potentially induce inflammation? I wouldn’t want to be inadvertently promoting skin inflammation through skincare products. Thanks in advance! Love this article! However, why do most skin care products have 1-2% if the studies indicate that 0.1% or 0.2% are beneficial? I am confused. f.c., Have you tried the Hada Labo Premium Lotion yet? I am on the fence with which one to try now after seeing that at the end of the article. Which step does HA go in for skincare? Thanks for the detailed article. 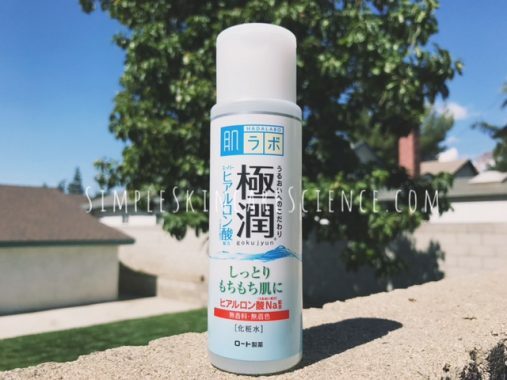 Have you tried the hada labo premium HA lotion? it’s even better than the original one, the texture is less runny and super hydrating. Btw there seem to be issues with the notifications: I did not receive anything for quite a while. Is there any studies examining the effects of HA in dry climates? Hey f.c.! Is there any difference between the Hada Labo Rohto Gokujyn Hyaluronic Acid Lotion and the Hada Labo Rohto Gokujun Hyaluronic Lotion Moist? I am wondering how could LMW HA can dry the skin out! Do you have any thought on this? In my country, beauty bloggers say that high concentrate of HA can draw water from deeper layer and dry out the skin. But I always doubt it. Is it true that humectant draws water from deeper layer to the SC and therefore dehydrate the skin? Great article! What is your opinion on hyaluronic acid precursors like those used in Hylamide’s and NIOD’s? You make skincare science fun! I’m a Hada Labo fan and have been waiting eagerly for my arrival of the premium lotion. I wasn’t aware of the addition of urea. I looked into urea after seeing you mention it for your fungal acne article. I ordered 20% and 40% urea creams to use on my keratosis pilaris for its keratolytic properties. Not sure if that is something you also deal with but I would be so interested in your thoughts on best products and treatments for it KP. Thanks! GreatGooglyMoogly! Your posts are really making the science geek in me come out! I’ve been toying with the idea of creating my own facial cleansing oil, because I want to custom formulate for my skin; I’ve learned certain things work, like camellia seed oil, rosehip seed oil, caprylic acid, green tea extract, ginseng, licorice root extract, and few other things. I also fantasize about whipping up a serum for my scalp that will keep the evil malasezzia away, based on Traditional Chinese medicine. I’ve been using a Korean shampoo, conditioner and scalp serum with Hanbang ( oriental herbal medicine, Korean style) as well as a healthy routine on my face. Your recommendations have worked well in my case. The lower Ph cleanser (Mamonde Lotus Micro & Sulwhasoo Snowise Ex) the BHA treatment ( Stridex, then later CosRx), and Laneige water bank have done a lot to bring back my skin quality. HA is fantastic for long haul flights. Imagine 16 hours on a 777 every other month for 2 1/2 years. I can attest it helps. The link to swiftcraftymonkey was really interesting and I will be turning my spare bedroom into a mad scientist’s laboratory now. Maybe that’s the future of skin care – personalized formulation? Where in my routine would I use this? Would it be oil cleanser>WB cleanser>toner>bha>aha>Hada Labo>etc? Thank you very much, your blog is awesome, I’m learning a lot!! Sorry for all the questions! And thank you so much for everything. Your shared information and knowledge has my skin almost completely clear, and I cannot even begin to thank you enough for that. Hi! I have tried (on separate occasions!) two different Hada Labo products, and both left my face with irritated bumps which broke my heart because aside from that, it made my face look incredible. Do you think perhaps I could be sensitive to one of the various form of HA offered in their products? For the record, said products were the lotion and skin plumping gel cream. I targeted the HA since the rest of the ingredients are so benign.